Many houses have the loft on either side of chimney breast, and they’re likewise a feature in the modern homes and fitted home office, where extensions and renovations can make the unusual nooks. 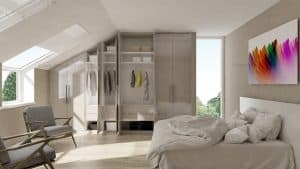 The bespoke wardrobe is an awesome method to capitalise on these often unused corners, and there is a wide range of alternatives for beautiful and bespoke shelving and cabinets which can have a great difference to the way you use your living space. If you need to benefit as much as possible from the slopping ceiling space in your home, here are a couple of things to consider. One of the principal things to think about is the kind of look you need – modern wardrobe or bespoke traditional closet, or may be even no-door unit. You might also consider mirror to make the space look larger and lighter or push-to-open doors to keep minimalistic style. In terms of the inner features of the wardrobe – almost all customer wish to have a hanging pole to keep the clothes from getting creased. Another thing that many homeowners opt for is lightning – movement sensor to get the light on when you open the door or switch option are both great to add an accent and to make the dressing experience even more exiting. Cabinets, racks and poles, you may have exceptional utilizations for your storeroom. Do you wish you had a full-length mirror in your fitted wardrobe? Would you adore tie rack, accessory drawer or fitted shoe storage? Knowing precisely how you intend to use your wardrobe causes you to determine every one of the augmentations you should make for your storeroom customization. With i-Wardrobes the experienced dedicated designer works with you at every stage of the process to create your made-to-measure wardrobe. Call now or leave your details to schedule your wardrobe design visit to get a quick quote and preliminary design drawings.